This is a nice 100mm lens and a really good length for portraits. As a macro lens it has a very short depth of field, even when stopped right down, which you should bear in mind when choosing it. It is a well-priced and useful lens for the effect it provides. For a higher price, but also higher quality, I have gained similar results using our Alura zooms with diopters, however this macro lens works as a great accompaniment to the other Canon L-Series lenses. While many Canon lenses have Image Stabilizer (IS) capable of regulating camera shake when working hand-held, this lens features a groundbreaking Hybrid Image Stabilizer system to counteract regular angular shake and lateral shift-shake which is exaggerated when shooting extreme close-ups. Shift-based shake occurs when a camera moves parallel to the image sensor scene, this is significantly more pronounced in macro photography. Usually macro photography requires a steady tripod, however the new Hybrid IS helps to eliminate angular and shift camera shake. This gives you more flexibility to eliminate natural camera shake and to respond to your subject if it moves or changes position, ensuring crisp images when shooting macro subjects. When the slightest disturbance can ruin a perfectly prepared live shot, the superb speed and silent autofocus of the USM motor paired with the 100mm focal length ensures you achieve the best results, whilst having enough distance so as not startle your subject. Use the built-in focus limiter switch to further increase the AF acquisition speed by limiting the focus within a specific distance range. Part of the prestigious range of L-series lenses, the EF 100mm f/2.8L Macro IS USM is engineered from the highest quality materials and is weather sealed to make it robust enough for shooting in all conditions. This lens is a great option for portraits because of the Ultra-Low Dispersion (UD) lens element that removes chromatic aberration and the exceptional bokeh produced by 9-blade circular aperture combined with f/2.8. The combination of the exceptional Hybrid IS, f/2.8 aperture and fast USM autofocusing system makes this a truly unique lens that performs exceptionally well, making it popular for those who occasionally do macro, as well as those that want to specialise in it. A great dual-purpose addition to your kit bag, the EF 100mm f/2.8L Macro IS USM is great lens for portrait photography, allowing you to get exceptionally close to your subject, whilst keeping incredibly sharp image quality. The EF 100mm f/2.8L Macro IS USM is everything you’d expect from a prime lens. Its excellent optical quality and superior delivery of ultra-fine detail is great for when your portraits need emphasis on facial features. 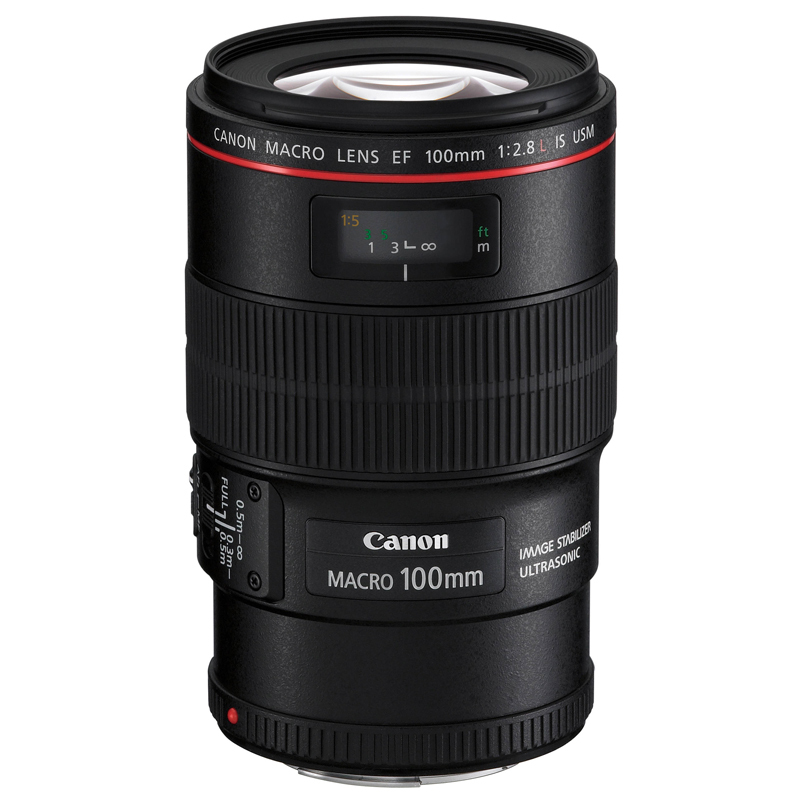 The 100mm focal length is perfect for portraits, enabling flattering close-ups without distorting facial features. The Hybrid Image Stabilization allows shooting of beautiful images, handheld in low light. The f2.8 aperture allows for a shallow depth of field, creating the impression of distance. This helps separate the subject from the background and draw the eye to focus on the detail you want.